This study presents an area-based deprivation measure for the island of Ireland based on the 2011 Census. Conceptually, it builds on the study undertaken by the authors in 2011 (Haase, Pratschke and Gleeson, 2012), which used small area (SA) data from the Republic of Ireland and Northern Ireland to construct a prototype of an all-island deprivation index. The index presented here embodies further advances, made possible by recent developments in data availability and harmonisation. The first major development relates to the 2011 Census itself, which was carried out concurrently in almost all European countries, providing data for both the Republic of Ireland and Northern Ireland. Secondly, small areas (SA) were introduced in both jurisdictions for the publication of aggregate data from the census, providing a better alignment of geographical units. Thirdly, the CSO and NISRA have worked together on an ambitious programme of data harmonisation, leading to a joint publication using socio-economic statistics from the census on an all-island basis (CSO and NISRA, 2014). 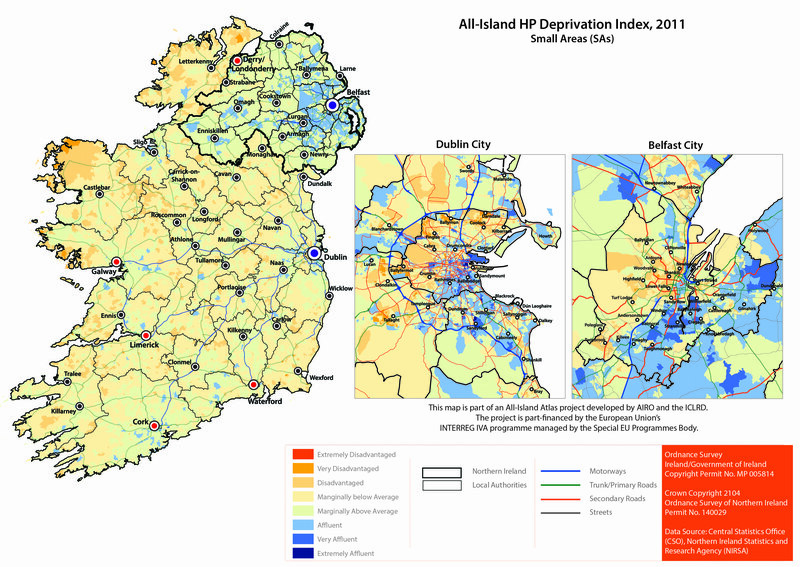 The new 2011 All-Island HP Deprivation Index builds on these developments and draws on a combined set of equivalent indicators to form a single deprivation index, providing a powerful tool for researchers and policymakers who are interested in understanding and seeking to reduce the social gradient that characterises a multiplicity of different outcomes in the economic, social and political spheres.